DEFlicker is your solution for problematic high frame rate and timelapse footage! DEFlicker by RE:Vision Effects is designed to smooth out annoying flicker and artifacts when shooting high speed or timelapse video. See what DEFlicker can do for you! In this example DEFlicker smoothes out the overall level changes using a selected reference frame so that it’s easier to watch. 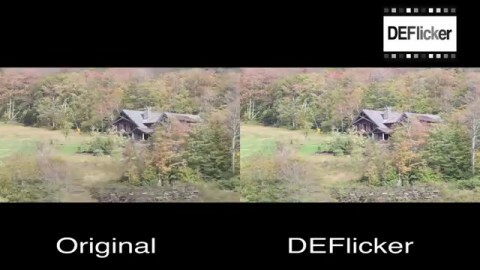 At the same time DEFlicker reduces the excessive and distracting frame-to-frame motion noise. 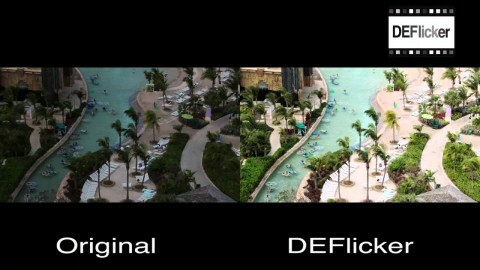 DEFlicker automatically smoothes out annoying flicker when shooting high frame rate or timelapse video. DEFlicker automatically handles the problems of strobing and flickering caused by man-made light sources when shooting high frame rate footage! DEFlicker will help transform your timelapse photography so that viewers watch the footage without the annoying pops that often accompany timelapse photography. Handle large amounts of frame-to-frame lighting variation in high frame rate footage. Automatically reduces flicker by combining the best of per-pixel tracking and local area color transfer methods. Handles flicker that only occurs in part of the image, and flicker of objects at different rates within the same sequence, even with extremely noisy footage. In sequences that fluctuate due to lighting, object or shadow variations, you can select reference, or "key", images that best represent the exposure you wish to keep for the sequence. Deploys a motion estimation algorithm that is less sensitive to large motion noise. Works with high-end cameras, point-and-shoot cameras, GoPro, cell phones, or any other device you have. Use a higher frame rate on your camera without having to worry so much about flicker and noise. Ability to preserve or smooth out noise. Ability to smooth out the average RGB and deviation values from frame-to-frame for the whole image using the analysis pass. Pre-analyse your footage to identify problem areas and bad frames. This product is GPU accelerated, and will use more than one GPU provided they are the fastest GPUs on the machine and are of the exact same type. Read more. Installed plug-in will work with Final Cut Pro 10.1.4 (and up) and Motion 5.1.2 (and up). The same OS and hardware requirements for the version of Final Cut Pro that you are using.